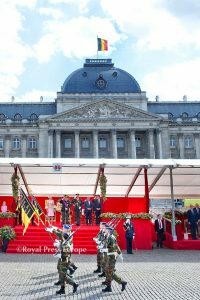 The Belgium Royal Family celebrates National Day on July 21, 2017. In 1830 Belgium declared itself independent from the Netherlands. Both of the countries were formed as the United Kingdom of the Netherlands from 1815-1830. King Philippe, Queen Mathilde and their four children Princess Elisabeth, Prince Gabriel, Prince Emmanuel and Princess Eleonore attended the Deum Mass at the Cathedral of St. Michael and St. Gudula in the heart of Brussels. The Royal Family will be attending several celebrations throughout the day. In the afternoon the traditional military parade took place.